I love courgettes (zucchini) a lot, my favourite summer vegetable. When freshly picked they have a lovely sweetness. Courgette can be bitter too, not very nice, I reckon may be due to the way they are grown or when they have been stored for over 4 - 5 days in the fridge. Always eat them as soon as you buy them or pick them. When buying and choosing courgettes look at the cut stem check if it is really fresh, if the cut stem looks dry and brown don't buy. 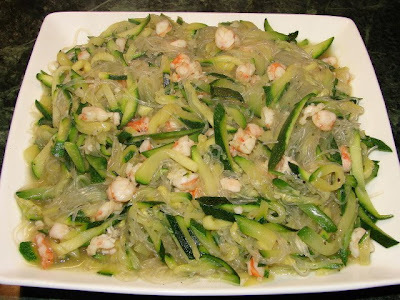 I love courgettes cut into long thin strips like spaghetti then cook with lots of garlic, anchovy and olive oil. Then stir into some pasta or spaghetti with a good sprinkling of parmesan. So so yummy! This recipe I am posting today is how I like to cook courgette Chinese style. This dish is mild yet very tasty with a lovely clean flavour. The combination of courgette, glass noodles and prawns work so well. I can eat a big plateful of this on its own but mostly I have it with some rice. To cook this dish, turn the heat to maximum all the way, so the wok or pan is really hot. Everything to be cooked very quickly, so the prawn not turning into rubber, the courgette is al dente and the noodles are softened very quickly. Heat the oil in wok till very hot, add the garlic in stir very quickly before it starts to burn add in the prawn. Stir briefly till prawn has changed colour and very fragrant. Add in the courgette stir fry very briefly then add in the noodles. Stir, add chicken bullion powder and add in a good splash of boiling water to cook the noodles. Soon as the noodles are cooked through and courgette is just soften yet with some crunch. It's almost ready. Seasoned with fish sauce, ground pepper and sesame oil. Looks good! Might try this one in the summer! I know what you mean about bitter courgettes - don't know why that happens, can put me off buying them. I choose the firm feeling courgettes. When you grow your own courgettes you never get the bitter-tasting ones and they keep very well in the fridge too! Have you tried growing your own courgettes?